I am not much of a T-shirt girl (which is why my overflowing T-shirt drawer is even more embarrassing! ), but I had to make an exception for this one because the story behind it resonated so much with me. In high school I got to be a part of a super fun, & very talented, competitive dance team. Our motto was "dare to be different" - choosing to go against some of the "trendy" dancer things, & pave our own path - which eventually led to 2 state championships (#humblebrag). The 16 year old me didn't really realize how special it was that I got to train with a group of my peers who supported each other in our uniqueness. Truth is, we are all a little weird, & finding people to embrace your weirdness is one of the great searches of life. So when this shirt from the ESPNW x Homage collection came into my life, I knew it was meant to BE! The ESPNW x Homage "BE" collection as a whole was inspired by the individual spirit & incredible courage of female athletes throughout history, with each piece sharing a story of a professional athlete who has followed her passion. 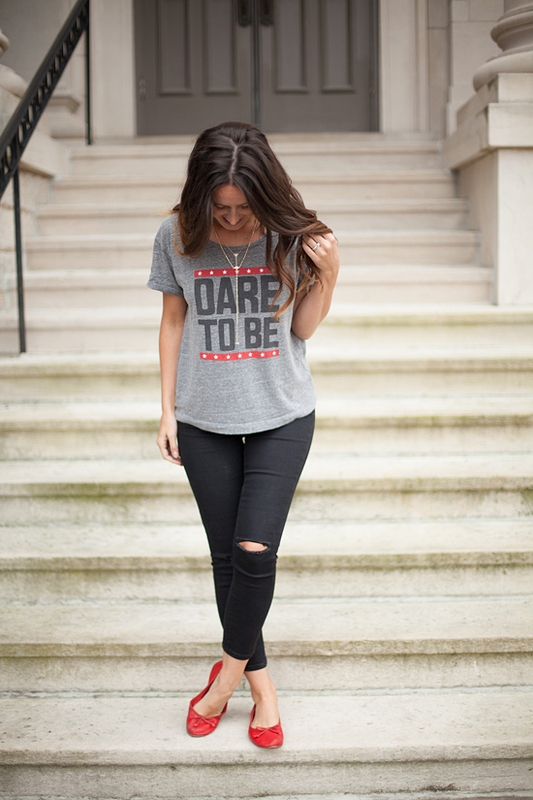 The "DARE TO BE" tee pays homage to hockey star Hilary Knight who did incredible things for U.S. Women's Ice Hockey in both the 2010 & 2014 Olympic Games. What I love is that Hilary did not let her youth stop her from achieving greatness & I love sharing her story each time I wear this top. Find your own story worthy piece from the collection here. 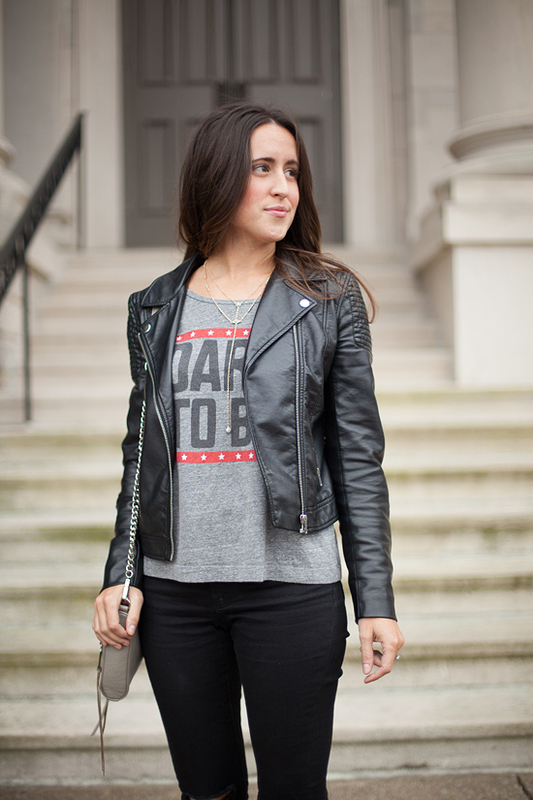 I like the look of T-shirts, but don't like wearing them to work out (usually too bulky) & rarely wear them in my daily life (with the exception of plain Old Navy tees), so when styling this shirt I made up some of my own tee styling tips. 1. You don't have to only wear your T-shirts with yoga pants. When dressing this shirt, I paired it with pieces I would normally grab for any other shirt. This move will make you one step closer to your dreams of achieving that "effortlessly cool girl" vibe. "Oh this, I just threw this together as I was running out the door…"
2. 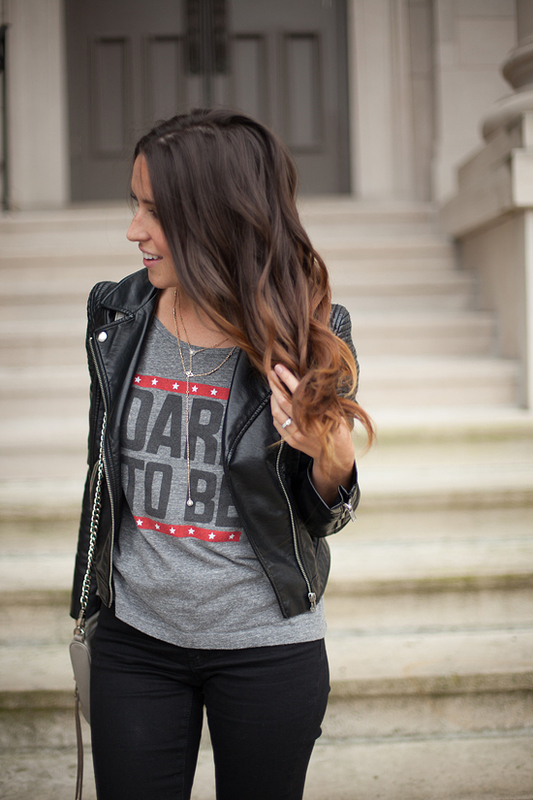 T-shirts make great layers. Peeking out from under a leather jacket, cozy flannel* or sweater, T-shirts can be a fun way to add a pattern or cheeky message to your outfit. *I just scooped up this flannel top that I think will look great with layered tees! Plus stayed tuned to see how I wore a T-shirt to work (oh the scandal) next week. 3. Don't be afraid to pile on the jewels! 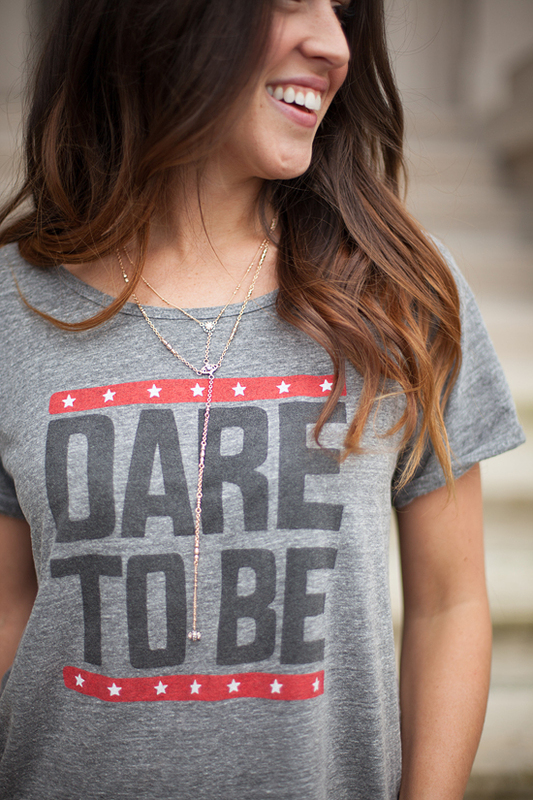 Dress up your tees with some of your favorite pieces - try mixing different lengths & metals to compliment the look. I love some of the more dainty pieces from Kendra Scott because they add visual interest with out blocking/overpowering your outfit. And I'm also totally crushing on this delicate necklace from Bauble Bar. How do you dare to be? Any other tee-styling tips? Please share in the comments!